Bailee Warner is a very special young lady. She is an 8th Grade student attending Leduc Junior High and when she’s not hitting the books she is training to become the best at Taekwondo she can be. Don’t be deceived by this quiet, smiling, unassuming, soft-spoken teenager. If you look closely you will see the eye of the tiger in her determination to be successful in her sport of choice. As a member of Leduc’s Tiger Taekwondo and under the tutelage of Grandmaster Su Hwan Chung, Bailee has shown constant improvement and recently came home from Montreal with a bronze medal at the Canada Open Meet. Competitors came from all over North America with some competitors coming from as far away as Asia. Bailee’s medal did not come easy as she faced Mona Parhar from Richmond Hill, Ontario in her semifinal match. Mona was able to use her quickness to defeat Bailee and went on to win the Cadet Elite 59 kilo plus title. Bailee and a competitor from the USA were presented with bronze medals. Bailee has competed in a number of events all over Alberta and has experienced the Tiger’s Roar in Las Vegas, Nevada. 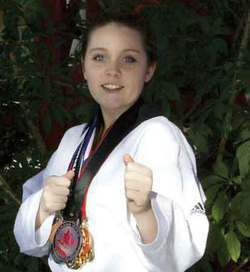 Taekwondo is not a huge spectator sports in Canada and often the only fans are Bailee’s parents and a few family friends. This has not deterred Bailee as she strives to learn and improve after each event. Her work ethic is one to admire as she works fulltime on her studies and then often spends 15 or more hours each week perfecting her Taekwondo skills. After trying a number of different sports Bailee decided that she would concentrate on developing her skills in Taekwondo. She liked the patience and discipline required to progress and how the discipline requires you to develop a strong sense of self and stamina while you gain an understanding of the skills and techniques to be successful. Bailee’s short-term goals are to prepare for the Alberta Open at the MacEwan University’s Sport and Wellness Centre in April and then the National Tournament at Toronto in May. If she continues to improve her long-term goal of representing Canada at the 2020 Summer Olympics in Tokyo, Japan might just be in her grasp. At this point that is just a dream, but one worth chasing. Unlike team sports where sponsors seem to abound individuals competing in activities like Taekwondo can find sponsorship difficult to acquire and depend heavily on their parents for support. As they progress this can become more difficult to maintain. Any company or individual interested in sponsoring Taekwondo are encouraged to contact the Tiger Taekwondo in Leduc.